Wow! Super cool live & work home. $100K+ home office addition added to include separate entrance, waiting room, private bath, office, and tranquility deck. Could also be nice mother-in-law or teen suite. Gorgeous gourmet kitchen update: 42" cabinetry, granite island, gas range, stainless suite, butler pantry, double ovens, and wine frig. Beautiful bamboo flooring. 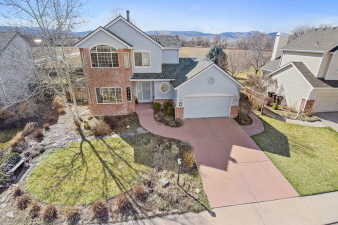 Huge home w/ lots of options - media room, home gym, play rooms. Amazing views of Indian Peaks and the front range. Open space and walking trails abound through Twin Lakes recreational area. Awesome neighborhood with pool. Buyer to verify all info.